Hunting is second nature to the Nagas, just life eating and sleeping. Hunting animals and human heads formed a core part of their culture, with many of their religious ceremonies centered around this practice. With the advent of the missionaries the head hunting practice came to an end albeit hunting of animals for food still continues. Today this practice is threatening to wipe out the sparse population of mammals found here; the Hornbill once found in plentiful is to be seen no more. In this perspective the village of Khonoma has set a very unique example by protecting a large part of their community forests. 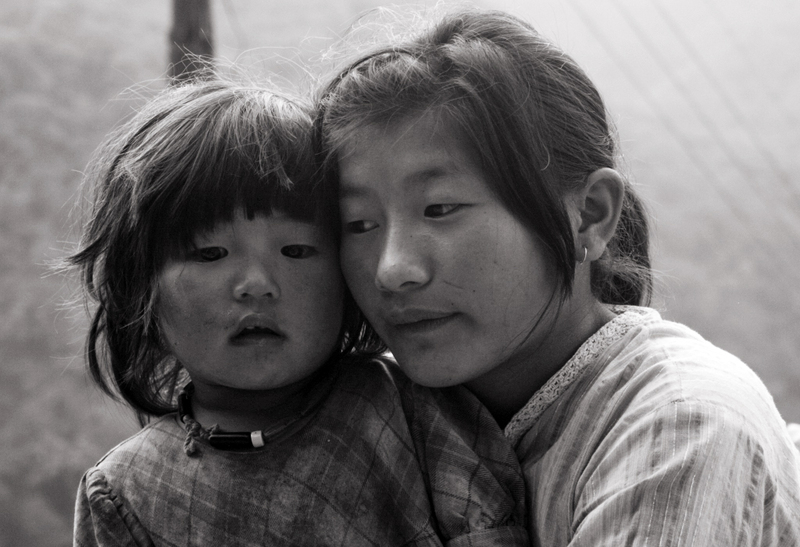 This Naga village is the stronghold of the Angami tribe, one of the sixteen major tribes of Nagaland. Bumps, potholes and even larger potholes characterised the twenty kilometer stretch from Kohima to Khonoma. The apathetic condition of a road so close to the capital surprised me. The village bore a very tranquil look when I reached there in the early afternoon. Tsile, my host picked me up from the stand guiding me to his place. As we climbed up to his house I noticed that the houses were quite dispersed unlike some of the other Naga villages I had been to. After exchanging a few pleasantries piping hot lunch was served, acting as the perfect medicine for my growling tummy. Later that evening Tsile took me through the village explaining the cultural and historic significance of the village. In the Angami dialect the village is pronounced as ‘Khwunomia’ which is a conjunction of the words ‘Khwuno’ and ‘Mia’. Khwuno is the name of a small plant found in plentiful around the village while Mia translates to dwellers. Geographically the village is divided into three sections called khels, namely Thevoma, Mehume and Semoma. Every khel represents one major clan, acting as the administrative and political body. Since the head hunting days each khel had their own fort to keep an eye on their enemies. The Angamis especially those from Khonoma were fierce warriors legendary for their bravery. They fought with the British thrice, keeping them at bay for the first two times. Wading our way through the narrow village lanes we reached the house of Anguile, a basket weaver. The village amongst many other things is also well known for its craftsmanship. Anguile a two time national award recipient was transforming ordinary bamboo into skilfully woven baskets, as though there was some magic in his fingers. Early next morning I strolled through the village moving towards the stupendous terraced fields I intended to photograph. 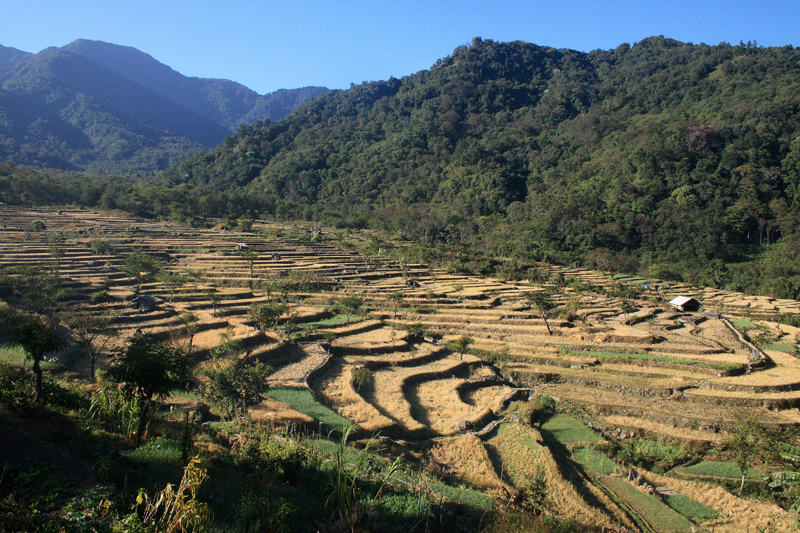 Khonoma is very famous for its technique of terraced fields, so much so that many people have actually undertaken studies on the same. The fields are so perfectly terraced that they can make water go around in an entire circle. So fascinated were some of the British officers that they wrote eloquently about the terraced fields in their notes. Over the next few days I got to learn more and more about the conservation initiative taken by this village. Khonoma stands out amongst all Naga villages not because of its bravery or craftsmanship but because of the fact that they have banned logging and hunting in their community managed forest. In the early 90s there was rampant logging around Khonoma, mainly undertaken by contractors from the plains. At one point there were around 130 elephants being used to ferry high quality timber from interior parts of the forest to truckable points. Some of the village elders were foresighted enough to see that the intensity of logging activities threatened to wipe out their forest. They realized that survival and security of the future generation depended heavily on the forest. With this understanding the village council laid a ban on logging in their community forest, with Tsile playing a lead role in convincing the villagers. In 1998 the Khonoma Nature Conservation and Tragopan Sanctuary (KNCTS) was formally institutionalised with a total ban on logging and hunting. Thanks to the foresight of Tsile and some of the village elders the forests are teaming with birds. The sanctuary has now become a major hotspot within the birding community. By the end of my six days I became an integral part of Tsile’ family. This is what I love most about my travels and working with communities, it gives me a deep sense of human relationship I can never feel in the cities. I keep finding a new home in every place I visit. Good to see your post on Khonoma. I have been to Khonoma. Its a beautiful place inhabited by equally wonderful people. I will go back again! Thank you for the post about about my village Khonoma. Do come again. Thank you for the crisp description of the beauty of my village, Khonoma. Come again when you get the opportunity. can you please give me the contact of Tsile , in case he does home stay ? Nice…can you give contact detail of Tsile…would love to visit this place. Hi Piran! op u r doin well!! I commented on this post in 2011 never knowing that It was you! was surfing n came across this again… thanks. stay in touch..
Traveller from around the world visit Nagaland but misses out Khonoma due to the road conditions,fooding and lodging but now we have started an Inn here in Khonoma for fooding,lodging and to feel the experience of a pleasant home stay. It may not be the standard of a city but we are trying to provide quality and standard at Dovipie Inn with good quality food in Indian,Oriental and Naga cuisine. With the very first Inn in Khonoma we are venturing into an area where an Inn is must for tourist.Hope that we can be of service to one and all during yuor visit to this green and historical village.